The Get Quenched Water filtration system is installed inside the water cooler, providing safe, great-tasting filtered water without the inconveniences of a bottle for your home or office in Alberta. 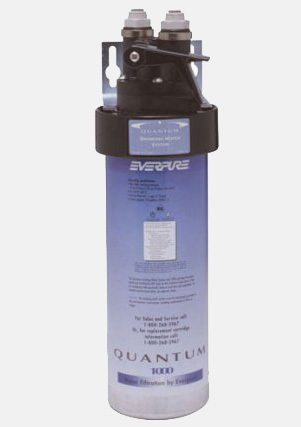 The Get Quenched filtered water system has an absolute 1/2 micron filter (1/50,000 inch), removing up to 99.9% of all particles like dirt, rust, asbestos fibers, harmful cysts such as Giardia (Beaver Fever) and Cryptosporidium, as well as lead, chlorine and other offensive tastes and odours like algae. The NSF seal is your guarantee of quality. NSF International is the leading independent testing and validation organization which sets international standards for drinking water systems. In a nutshell, our filtration systems provide pure, natural and healthy water for your body and mind. Want access to crisp, clean and delicious water right in your home or office? Contact us today to explore your rental options.